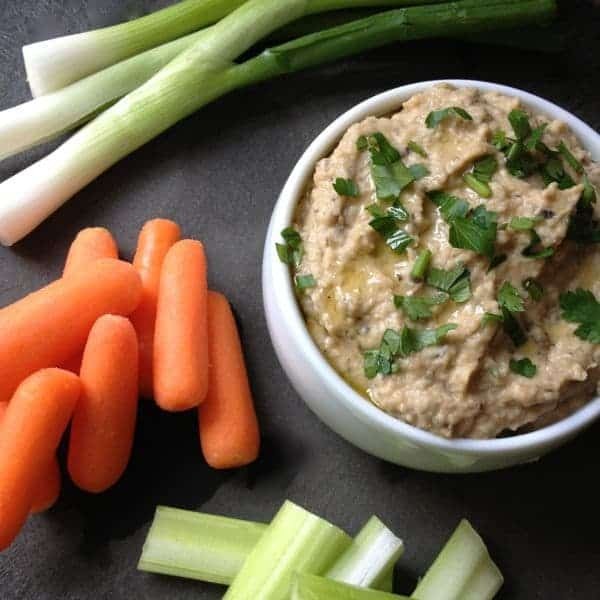 Baba ganoush, a traditional Lebanese appetizer recipe, is a delicious eggplant dip made with tahini, garlic and lemon. Drizzle with olive oil and serve with warm pita bread. You guys have been asking for my baba ganoush recipe and I’m so excited to finally share it with all of you! As much as I love hummus, and you know I love it, sometimes a gal just craves a little baba. 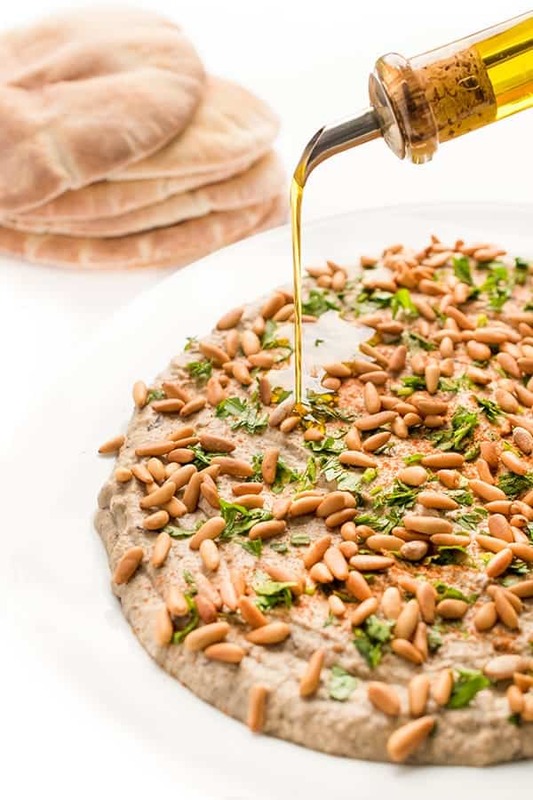 Made with roasted eggplant, tahini, lemon and garlic, this traditional Lebanese appetizer recipe could not be healthier or more delicious. For added smokiness, I like to gently charr the skin of the eggplant over an open flame before popping it in the oven to finish roasting. Since the skin contains a whole host of vitamins, antioxidants and fiber, I like to leave it on but you’re welcome to scoop out the flesh and discard it. For added crunch and texture, I like to top the platter of baba ganoush with pine nuts that have been toasted in the oven for about 6-7 minutes. Minced parsley adds a fresh grassy flavor which pairs perfectly with the drizzle of olive oil I highly recommend. 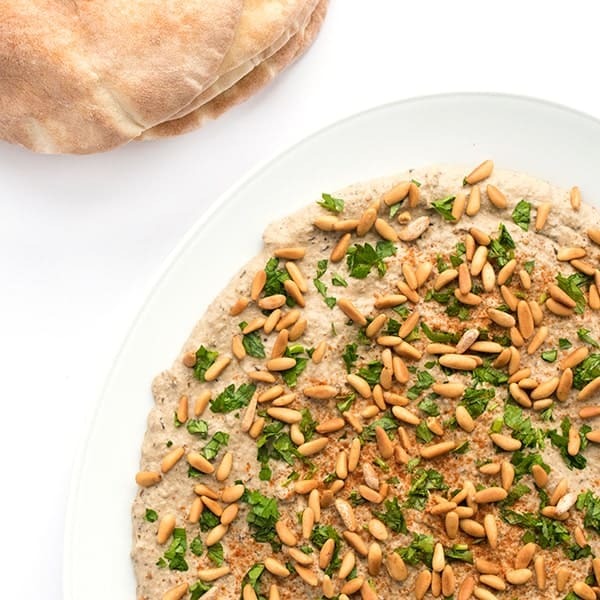 Made with roasted eggplant, tahini, lemon and garlic, this traditional Lebanese appetizer recipe could not be healthier or more delicious. Pre-heat oven to 400 degrees and pierce eggplant with a knife 7-8 times all around the skin. Optional Step for Added Flavor: While oven is pre-heating, carefully char the eggplant on top of an open stovetop flame using metal tongs. 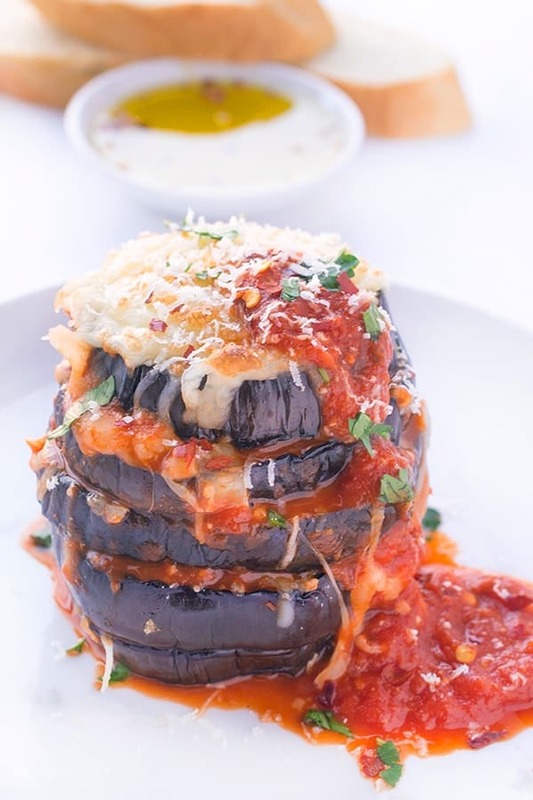 Rotate the eggplant ever 30 seconds for a total of 3-4 minutes or until it starts to get smoky on the outside. Roast the eggplants in the oven for 30 to 40 minutes then remove from oven until cool enough to handle. Cut into large chunks and place into a large food processor. Add tahini, lemon juice, garlic, salt, cumin and cayenne to the eggplant in the food processor then puree until smooth and creamy. Pour into a large serving platter then garnish with pine nuts, parsley and olive oil if you wish. Serve with warm pita bread. While I prefer to keep the skin on the eggplant for the added nutrients and fiber, feel free to scoop the flesh out of the skin before pureeing. Check out more of my Lebanese recipes on my Pinterest board! It was a bit bland and not much substance to it. 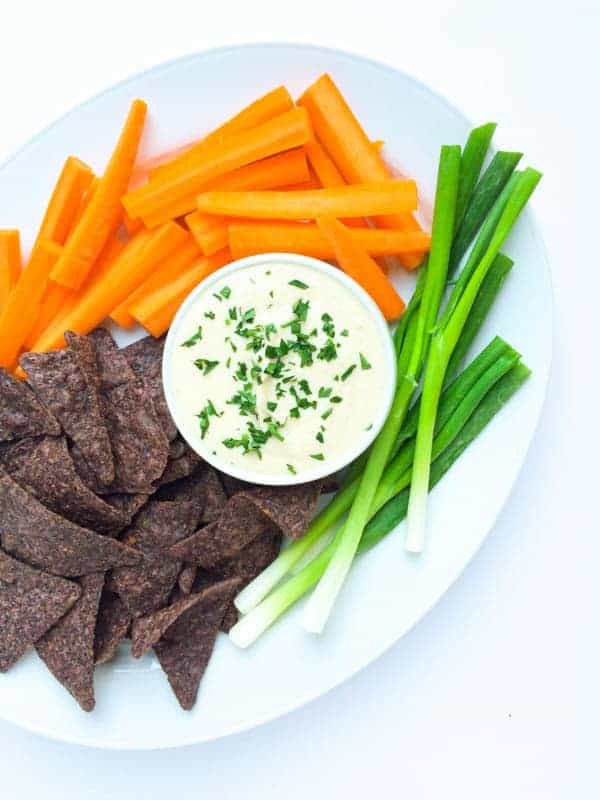 May have been too much tahini or lemon in this recipe but just too thin for our taste. I also made the “Authentic Baba Ganoush Recipe” by Sylvia Fountaine and it was AMAZING! Compared these two side by side and Fountaine’s was to our taste. Hi Sonia, I’m sorry you found it bland! We make this quite a bit and love it (did you add the toasted pine nuts on top btw?) Anyway I appreciate your candid feedback! How many days ahead can you make the baba ganoush and keep in the fridge? It’s so good and easy! I haven’t had baba ganoush in years. I really like the idea of charring the eggplant skin and leaving it on (I don’t peel things like eggplant, potatoes or sweet potatoes any more). The skin would also add flecks of color as well as nutrients. Yes!! The charring really makes it great!